Heat oven to 350 degrees. Put the whole quails in a previously greased oven pan, add salt and pepper. Place in oven, bake for 45 minutes or until the quail is tender. Remove the quails from the oven. Take the meat off the bones and cut the quail meat into small pieces. Set aside. Boil the potatoes, then peel and cut them in small cubes. In a large pan at medium heat, add one tablespoon olive oil, potato cubes, quail meat, salt, pepper and chopped chives. Mix it all and sauté until potatoes are lightly brown. In a separate pan at medium high heat, fry the quail eggs. For best results open the egg on a small bowl before putting it into the frying pan. Serve warm with toasted bread. 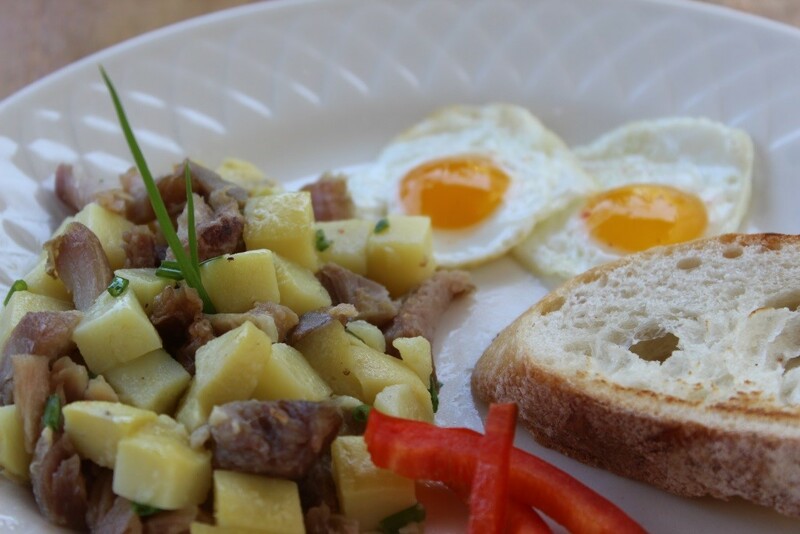 If desired, quail mixture can be placed over the toasted bread with a fried egg on top, for a Spanish “tapa” feel.